The dimension are 1010mm x 1190mm x 330mm. This fire uses one of our large burners. It has a fuel capacity of 2 litres and 1 litre will burn for 3.5 hours. The heat output for this fire is 2.5KW per hourceramic logset. 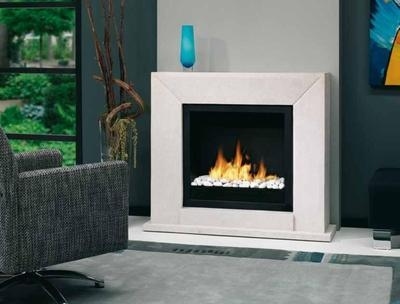 The Bio Flame Nero is a a sleek looking modern fire that, if you have a classically inspired home, this fire is probably not for you. The Nero was created with a modern home in mind. The Nero is shown here in an off white fossil stone finish. Click here to see fossil stone finish options. The Nero uses a unique burner with a patented ceramic core. The porous ceramic soaks up the bio ethanol like a sponge and then releases it in a controlled manner when burning. 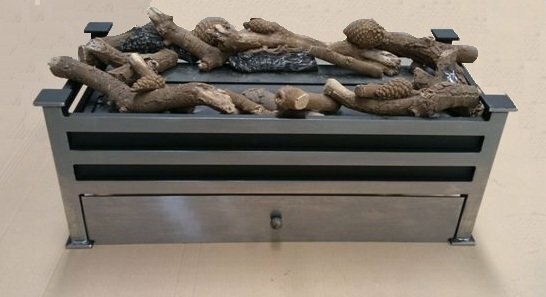 The bio burner is constructed from steel and is insulated to prevent the area getting too hot. This fire will give out 2.5kw of heat. The burner in the Nero can hold a total of 2.5 litres of fuel, which will last for 4 hours in total. The Nero burns bioethanol fuel, which unlike gel fires does not need cleaning. This fire uses one of our large burners. It has a fuel capacity of 2 litres and 1 litre will burn for 3.5 hours. The heat output for this fire is 2.5KW per hourceramic logset.